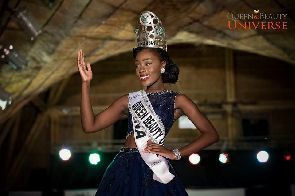 Abena Akuaba Appiah is a Ghanaian damsel whose beauty and intelligence transcended the boundaries of the Americas through to Malaga, Spain where she was crowned the Miss Queen Beauty Universe 2016. Last month , Abena’s high presence of the mind and glowing beauty was put to a tough challenge on a global platform with her competitors coming from every part of the world. It was the renowned Queen Beauty Universe Pageant, for the year 2016. This pageant is one of the credible and widely watched beauty contest around the world. It brings out, grill and test the unique qualities in young and ambitious women who wants to use their beauty and intelligence to promote and help humanity through diverse ways. Abena, a student of Mass Communication at the State University of New York expressed interest in and started her modelling career at a very younger age. It really did not take long for friends and families to realize the rare potential in their loved one. With unprecedented encouragement and support coupled with hard work and perseverance, Abena has risen through the dangling depth of the beauty pageant realm to its pinnacles of glory. Last Saturday in Spain, her name was captured on stones, embolden with gold. Abena Akuaba Appiah is a model, TV presenter, musician, actress and entrepreneur with 5 years experience in the fashion industry. Sh2e has modeled for most of the top name designers from around the world such as crèmè de la crèmè from the United States, Andres Aquino from Spain, sushma Patel from India, Catalan from France, late Kofi Ansah from Ghana, just to name a few. In a chit-chat with the new Miss Queen Beauty Universe, Abena uncontrollably expressed her excitement in achieving such a prestigious feat. She relayed profound gratitude to friends and families who rallied behind her when the going got tough. This could never have been possible without them, she said, emotionally. Born in Ghana and raised in America, Abena grew up to love modelling. With her high sense of belongingness as a Ghanaians and unwavering Ghanaian-ism, Abena promises to use her position to also bring the Ghanaian in her to light through spending time and resources to help young girls to be self confident. Abena is the first Ghanaian to win an international pageant: Queen and Beauty 2016 . With proudness, the Ghanaian community both home and abroad congratulate Abena Appiah for this great achievement that does not only celebrate her accomplishment as an individual but her Ghanaian heritage as well.